Once in a while, there arrives a cricketer who changes the way of the game. From Sir Don Bradman to Sachin Tendulkar and from Muttiah Muralitharan to Glenn McGrath, all left their marks and the world followed them. India’s very recent game-changer happens to be MS Dhoni. Also, he is one of the cricketers of the generation who has stamped himself firmly in the cricketing books. Know everything about him in this MS Dhoni biography. The describers of Captain cool run out of superlatives when talking about him. Such is the stature of the man that he leaves all of us amazed each time with his magic. India’s most successful captain is now a living legend. Certainly, he is the one that the young and aspiring cricketers follow. Not just from India, but all across the cricketing fraternity follow MS Dhoni. First of all, his is an inspirational story. The lads from the Urban cities like Delhi and Mumbai ruled cricket in India. MS hailed from a small town and reached at the helm of affairs. The desire to represent his nation kept him going despite all the troubles. And here he stands as the best leader the country has ever seen. As the number on his jersey suggests, Mahendra Singh Dhoni was born on 7th July 1981 in Ranchi Jharkhand. His father, Pan Singh, is a former employee of MECON. MS Dhoni’s mother, Devaki Devi is a housewife. Narendra Singh Dhoni is his elder brother, he is a politician. While his elder sister Jayanti Gupta is an English teacher. He got married to Sakshi Singh Rawat in 2010 and the couple has a daughter named Ziva. Why MS Dhoni biography became so famous because his story has everything from struggle, turning points, hard work, love, passion, success etc. That’s the reason why the movie made on him in Bollywood turned out to be a blockbuster. Initially, it wasn’t cricket that MS turned to. He was the goalkeeper of his school’s football team, DAV Jawahar Vidya Mandir. One day, to fill in for the wicketkeeper of the cricket team, the coach sent him as a replacement. That was the turning point in his life. After that Dhoni adapted cricket and cricket adopted Dhoni. His impressive performances as a wicketkeeper as well as a batsman gave him a prominent slot in the Commando cricket club team. He kept climbing ladders of success as a teenager. He went on to play Ranji for Bihar in 1999-2000. Dhoni scored an unbeaten 68 in his debut game. Then notched up a hundred against Bengal in the next season. Playing in the domestic cricket builds a base for the long term but it didn’t ensure a wealthy life in those days. Hailing from a middle-class family, he had to look for additional ways to earn. Hence, he served as a Travelling Ticket Examiner (TTE) at Kharagpur railway station. A job that he secured with the sports quota. From 2001 to 2003, he stayed with his job but was destined for something far bigger. Despite the family pressure to continue with the job, he kept putting the hard yards in on the cricket field. But the luck was not by his side as in spite of being picked in the Duleep Trophy squad for the East Zone, he couldn’t reach Agartala, the venue for the match, in time. But it didn’t stop him. He kept going strong and forced the selectors to turn their attention towards him. Dhoni’s performances in the Ranji Trophy and the Deodhar Trophy didn’t go unnoticed and the 2003-04 season finally brought some good fortunes. He finished on the winning squad in the Deodhar Trophy and was picked for India A squad for the tour to Zimbabwe. He was impressive in his stint with India A and the then captain of the national side, Sourav Ganguly saw something special in him. Eventually, MS Dhoni got he wanted all his life. In the year 2004-05, he was picked in the Indian squad for the Bangladesh tour. He did ODI debut against Bangladesh at MA Aziz Stadium, Dec 23, 2004. He featured in his debut game and got run out for a duck. The whole series didn’t yield fruitful results but the selectors showed faith in him and gave him another go for the ODI series against Pakistan. The rivalry between India and Pakistan is the one that the whole world watches with keen eyes. There couldn’t be a better stage for MS Dhoni and he pounced on the opportunity and announced his arrival in the game of cricket. In Visakhapatnam, Ganguly promoted him to bat at No.3 for the first time. He scored a magnificent 148 off just 123 balls that included 15 fours and 4 towering sixes. India scored a massive 356 and thumped the neighbors by 58 runs. After that, another explosion from Dhoni’s bat came against Sri Lanka when he scored 183 runs, his highest ODI score till date. Very rapidly, he built a reputation of being a power hitter. But contrary to that, he later made a mark batting down the order when he finished matches for India. In short, there was no stopping MS Dhoni as he rose to the top of Indian cricket in no time. The Indian team had traveled to the Caribbean to take part in the 2007 ODI World Cup. Led by Rahul Dravid, it was a star-studded unit with the likes of Sachin Tendulkar, Sourav Ganguly, Virender Sehwag, Anil Kumble and Harbhajan Singh. But opposite to the expectations, India crashed out of the tournament in the first round itself after suffering humiliating defeats at the hands of Bangladesh and Sri Lanka. The team including MS Dhoni received huge criticism and rage from the fans. Later that year, the inaugural World Cup of T20 cricket was to be held in South Africa. All the big guns had pulled out of the squad and as a result, MS Dhoni became the captain of the side which had young and fresh talents. India went on to lift the trophy and that was the official inception of the Dhoni era in Indian cricket, under his leadership. He became the ODI captain, after the victorious triumph. Leadership came naturally to him and once he got that, he flourished to his best. After Anil Kumble retired from international cricket, Dhoni became the skipper of all 3 formats for India. During his captaincy, the Men in Blue achieved several remarkable victories that included the Commonwealth Bank tri-series in Australia. Team India went on to become No.1 in ICC Test Rankings in his reign. MS Dhoni overtook Ricky Ponting and became the No.1 ODI batsman in Rankings and amidst all this. He turned out to be the costliest player in the first-ever auction of the Indian Premier League and then went on to lead Chennai Super Kings to IPL titles on 2 occasions. Dhoni was in no mood to stop and bagged the most significant achievement of his career when he led India to its second ODI World Cup triumph in 2011. Also, he played an inning of unbeaten 91 in the World Cup final against Sri Lanka at the Wankhede Stadium. That inning was one of the finest knocks in the history of the game. He soaked in the pressure and calmly took India past the line. After 2 years, India won the ICC Champions Trophy in England with MS Dhoni being the captain. India reached the semi-finals of the ODI World Cup 2015 and World T20 2016. He relinquished the captaincy post that and handed over the reign to Virat Kohli across all 3 formats. He had retired from the longest format of the game in 2016 but went on to represent the side in ODIs and T20Is. His IPL franchise Chennai Super Kings was suspended for a couple of years. Because the owners of CSK were alleged to be involved in betting. As a result of this, he moved to a new franchise names Rising Pune Supergiant. He was named the captain of the side in 2016 but, the team didn’t do too well. In the next season, he was dropped from the captaincy role and Australia’s Steve Smith went on to lead. RPS made it to the final but lost to Mumbai Indians. 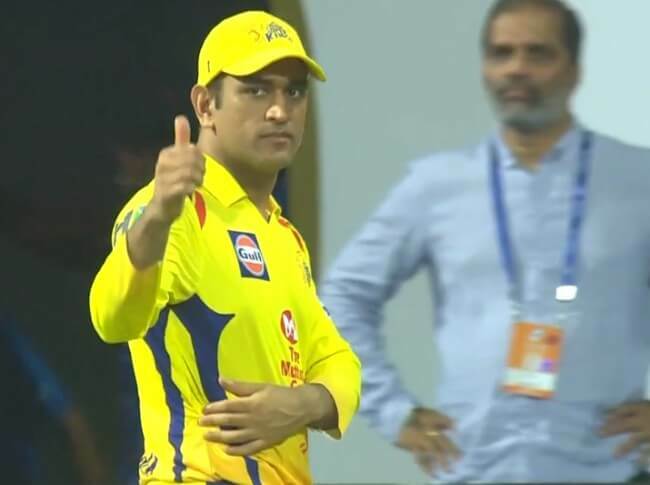 Recently, when Chennai Super Kings returned to the IPL after serving a suspension for 2 years, MS Dhoni was back as the leader once again. He brought them the 3rd IPL title as CSK equaled Mumbai Indians for the most number of IPL titles. His personal form was great in the tournament. He was striking sixes and finishing matches for the side that brought the vintage MS Dhoni back on the field. His brilliant run in the IPL 2018 brought hopes of his return to form in international cricket as well. But his form in the national colors remained a cause for concern as he failed to make a big impact with the bat. He was struggling to up the ante and wasn’t anywhere close to his best. In 2018, the selectors dropped him from the national side for the shortest format of the game. As the selectors believed it was time to groom a new wicketkeeper. MS Dhoni was still a prominent member of ODI side as he had 2019 World Cup in the mind. In short, his focus solely remains on the World Cup as he might hang up his boots after the coveted tournament. It remains to be seen whether the Captain Cool brings glory to the side once again. But one thing is for sure is that he will go down as one of the finest cricketers to have ever graced the game of cricket. Throughout his career, he wasn’t just a captain but a great mentor. Many cricketers give credit for their success to MS Dhoni. Indian cricketers like Ravindra Jadeja, Rohit Sharma owe their careers to him. They say, in spite of several failures of them in their initial careers, MS believed in them. And look what Rohit and Jadeja have been able to achieve now. Dhoni proved to be a leader of the side even though he wasn’t the captain. Virat Kohli was lucky to have him in the side during his initial days of captaincy. Kohli would turn to Dhoni for advice and the legend would deliver like always. Not just that, he aided the young spinners from behind the stumps. He groomed the young spinners like Yuzvendra Chahal and Kuldeep Yadav in his later stage of the career. Once MS calls it quits, there will be a huge void that would be impossible to fill. The MS Dhoni Biography doesn’t just end here. There are several chapters that will arrive in his already illustrious career. Being a great mentor, he has a bright career in the coaching business. Despite leaving the game soon, we expect him to be associated with this beautiful game for a number of years to come. In 2008 and 2009, MS Dhoni won the ICC ODI Player of the year. From 2008 to 2014, he was named in the ICC ODI XI (for 7 straight years). Also made it to the ICC Test XI in the years 2009, 2010 and 2013. He has won 20 Man of the Match awards and 6 Man of the Series awards in ODI cricket. Along with that, he won the Man of the Match twice in Test cricket. MS Dhoni received the Rajiv Gandhi Khel Ratna award in 2007. MS received the Padma Shri, India’s fourth highest civilian honor in the year 2009. He received the Padma Bhushan, India’s third-highest civilian award in the year 2018. Most number of sixes as a captain in international cricket. Highest score as a wicketkeeper in ODIs (183). First Indian wicketkeeper to score 4000 Test runs. Only captain to lead in 50+ matches across all 3 formats. Won most T20Is as a captain. Most stumpings in international cricket. Only captain to score a century batting at No.7 in ODIs. First Indian captain to win a Test series in New Zealand. Most centuries batting at No.7 in ODIs. Most successful Indian captain in all 3 formats. Highest ODI average as a wicketkeeper-batsman. Highest unbeaten innings in successful ODI run-chases. Most international matches as a captain (331). 800 dismisles behind the stumps. Superb blog… must read …. Very informative… Helped a lot in knowing the relevant information. Awaiting for the upcoming blogs. You are doing a great work. The writing skills are brilliant. I am very happy to get all the information about my Favourite cricketer at a single place. This blog is a very nice and clear example for those who are into blog writing. It gives very clear guidelines about how to write a blog. I was looking for this kind of accurate and up to date information about MS Dhoni. I appreciate your efforts that can be seen in the information provided. Well defined and informed. Well explained about the captain from his early days to all his achievements. Thank you for all the information. Good job. Msd is a legend.. this blogs tell all his achievements for india. useful post and amazing write-up. best blog I went through till date. very well written. MSD is best of all. Captain Cool is an amazing player. The blog is outstanding and very well written. Circadiun is one of the best blogging websites I have been through. It provides details very accurately. Dhoni is an ideal for a lot of people. I like the way how each and every detail of captain cool has been explained. Thank you for the provided info it helped me in knowing everything about MSD. very well written. very informative. Keeping all the details in mind you ended up writing an amazing blog. Liked the framework of the blog. Very well informed. Amazing and easily understandable blog. You can know each and everything after reading this amazing blog. Loved the blog very helpful. awesome blog it helped me in knowing everything i wanted to know. the best blog about Dhoni I have came across till date. great job. i am looking for the more upcoming blogs. Nice content.. i really like this blog. Best and up to date blog about MSD. Impressive!! Thanks for the post.. Very interesting for the ones who want to know everything about captain cool. Accurate information for a new blogger. this blog is great check it out.. This blog depicts the clear image of MSD. waiting for the new ones. I m happy to read the amazing post about Captain Cool. Nice article.. waiting for more articles to come. After reading this blog I am so impressed. now I am going to check out other blogs too. nice blog. cricadium is a good place to know updates about cricket. I appreciate all the quality research you have done. Great website and very interesting blogs. Very smartly summed up all the information about the legend. I read many blogs about MSD but found this one the most informative of all. Thanks for every single detail about captain cool. I had some doubts. but after reading the blog they got cleared. After reading this blog I recommended some of my friends to read it. everyone liked the blog. great job. The blog is big and has all the info about MSD one can look for. Awesome blog waiting for your upcoming blogs. I got to know more things that I was unaware of.. after reading this blog. Impressed by the way you collectively displayed all the relevant information about Captain cool. I have been reading all the blogs at cricadium. This one is the best i found. I wanted to know all the info about the achievements and awards of MSD. Thank you for this info and wonderful article. Thanks for the awesome blog.. i found here the information i was looking for. Thanks for the amazing content. Proper content and easily understandable one. Please keep posting such more blogs.